Our family instantly fell in love with Bald Head Island and we believe yours will too! You will arrive via short and fun ferry ride departing from the quaint town of Southport, North Carolina, to the unique island setting where the only wheels allowed are golf carts, bikes, and scooters. Here you will say 'good-bye' to the stress of everyday life and 'hello' to much more than a beach vacation. Contact Sherry @ #704-621-0796. Our beach house named 'Pleasant Boundaries' is located in the highly desired Killegray Ridge section of the preferred South Beach area. 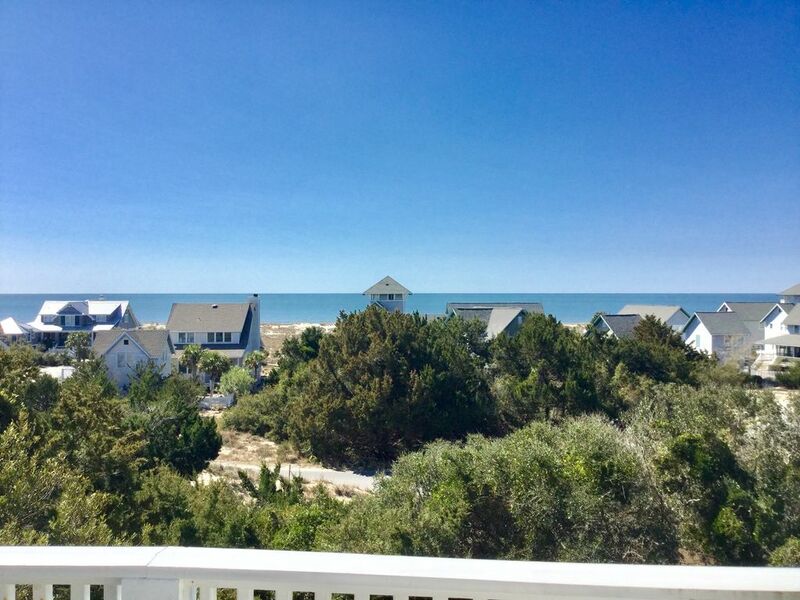 Large dunes offer natural beauty, rolling topography, and panoramic Atlantic Ocean views from our main living areas, screened porch, and viewing deck. If you love a tremendous OCEANVIEW for SUNSETS... Our Beach House is it! Classic Cape Cod styling to the homes along with white picket fences in Kilegray provide an upscale yet warm atmosphere. The Outside Hot and Cold private shower make it great to rinse the kids and toys after a long day on the beach. In the garage you will find two Golf Carts for adult use. The house is also located in a quiet, cul-de-sac location. Enjoy the swing or a rocker from the screen enclosed porch with beautiful view or hang out on the viewing deck and watch the sunset. 'Pleasant Boundaries' is beautifully decorated and is perfect for a large family or two small families. There are 3 bedrooms in the main house & 1 in the Crofter. Our guest cottage or 'crofter' is a great retreat for the in-laws or 2nd master, complete with it's own mini-fridge, coffee maker & microwave. Inside the main house there is a view from several rooms. Stand at the kitchen sink and watch the dolphin play. (If I could stay here all summer, I would.) The living, dining, and kitchen are all open to each other with high ceilings and hardwood floors providing large open space to gather the family for meals or play a game. The bedrooms are spacious, softly decorated, and have VERY comfy bedding. Lots of windows to leave open and listen to the ocean as you drift off at night. The 'Craftsman' finishing on the outside of the house continues on the inside as well, with bead-board wall and extensive trimwork. The house is equipped with everything you should need for a complete vacation. Fully-equipped kitchen, beach towels, beach chairs, beach toys, boogie boards, DVD library, all linens and towels, games, etc. You will probably only need to pack your clothing and rollerblades or scooters as a great market style store is just a short cart ride away. Your vacation with us can include privileges at the BALD HEAD Island Club, which offer oceanside swimming pool, tennis, access to the 18 hole CHAMPIONSHIP George Cobb designed golf course (fee required), access to wonderful dining options. The SHOALS CLUB has a beautiful pool, superb dining & lovely views out to the point of the island. Both Island Clubs can be added for an additional charge. We are the Roese Family. We live in North Carolina & have always loved the beach. We wanted a permanent place to come to that was safe for the kids to be kids and where we would want to come again & again. We are an active family, love being outside & enjoy the nature experienced on BHI. We are always sad when it is time to leave "Pleasant Boundaries"! We chose Bald Head Island because there is no other place like it!! Once you hop on that ferry you leave life behind and enter a world where the beauty of creation and relationships become the focus. Our mid-island, quaint location make it central to everything on the island and give it a special "New England" feel. Our home, “Pleasant Boundaries” has incredible views...breathtaking actually! Sitting on the upper porch at sunset is beyond words. We are located mid-island so everything is just a few minutes away. Our closest boardwalk it about a 2 minute walk from the door. Bramble Reach is a quiet cul-de-sac & is a great place for the kids to roller skate or ride scooters. We also take great care in keeping the house fresh, updated and clean...new towels & bedding regularly. 3 Full Baths plus one 1/2 bath. Roeses are members of both The Bald Head Island & The Shoals Club. Guests may purchase temporary memberships if they chose. S & P, foil & plastic wrap Complimentary "Starter Pack" for kitchen. Access with Temporary Membership to BHI Club if purchased. Access with Temporary Membership to BHI Club, if purchased - Guests pay temporary member playing fees. With Temporary Memberships if purchased. Our family had such a wonderful stay at Pleasant Boundaries. Plenty of space, the view from the top deck was gorgeous, and the house was clean and had all the needed amenities. The owner (Sherry) was always so warm, accessible, and helpful both prior to and during our stay, and you can feel that positive energy in the home. Highly recommended! Stacey, thank you so much for the kind & positive review! Your family was a delight to host and you all are welcome back anytime! Thanks for choosing “Pleasant Boundaries” for your 2 week stay on the island! Sherry was very helpful, informative, and responsive; the house was beautiful, clean, and had everything we needed, especially for an extended family with two toddlers. Comfortable beds, well stocked kitchen, and everything in good repair. The view is beautiful and the location perfect with walking distance to a lovely beach. The crofter was the perfect, peaceful place for this grandmother to retreat to after enjoying sunsets from the porch. Thank you Kathleen for choosing “Pleasant Boundaries” for your island stay & the kind review! Your family were wonderful guests that took great care of our home! You’re welcome back anytime! We stayed for 5 nights in May. The home is perfectly located, walking distance from the beach, and comes with access to the golf and tennis BHI Club. The house is fabulously organized and labeled and as user friendly as it gets. Though not huge there are ample places for a family to spread out and not be on top of each other. The golf carts, grill, and bikes are well maintained and make the stay super enjoyable. Sherry was always available and responsive if any questions arose. I would come back here in a heartbeat. Thanks Sherry! Thanks so much Alexis for the kind words! We try to make our guests stay at “ Pleasant Boundaries” special & easy! The property is so clean and well kept. The owners are delightful and the location is perfect!! Thank you Paul for the kind review! So glad your family had a great week in our home. You would definitely be welcome guests again so we hope you come back! Great 4th of July vacation! We had a wonderful week at Pleasant Boundaries. The location is perfect being close to the beach, the store and the BHI club. The owner was extremely helpful with all details and went over and beyond making sure we had all the inforamation we needed. She even called and checked on us while we were there. The house has an amazing view and plenty of space to be together as a family or group. The bedrooms are great and are on the first floor so you are able to get a good night sleep without hearing those that may be upstairs in the family room. I would highly recommend this place to anyone! Our family had a great week staying at Pleasant Boundaries. It is beautiful and located close to everything on the island. The house is very well stocked. Sherry has thought of everything from all the kitchen items you may need to boogie boards and sand buckets!! We will definitely be back again. Thank you Jennifer for your kind remarks! We are thrilked you chose to stay in our home & that your family had a wonderful week! We love our location as it is CENTRALLY LOCATED on the island! 2 minute walk to our boardwalk on South Beach or a 5 minute ride in the cart to East Beach. Set on the dune ridge of Killegray Ridge Highlands provide incredible views! You might even catch a glimpse of the deer as they peek out from the Maritime Forest right behind us. Rents SUNDAY - SUNDAY 4th of JULY HOLIDAY RATE = $4200.00 All bookings are subject to conversation with & approval of by owner. ALL deposits & reservations are subject to signed Owners Rental Agreement. ADDITIONAL $100 charge for deposits made with CREDIT CARD.